Pneumonia is an infection in the lungs. It can be mild or serious. The illness can be caused by bacteria, viruses and fungi. Some common symptoms include fever, cough, tiredness (fatigue) and chest pain. Treatment depends on the cause of the pneumonia. Some types of pneumonia can be prevented with a vaccine. Good handwashing and hygiene can also help. Pneumonia is an infection in the lungs. It can be mild or serious. Pneumonia is generally more common in children younger than 5 years old. Pneumonia is most often caused by bacteria or viruses. Some of these bacteria and viruses can be spread by direct contact with a person who is already infected with them. Mycoplasma pneumonia. This often causes a mild form of the illness called walking pneumonia. Respiratory syncytial virus (RSV). This is most often seen in children younger than 5 years old. Pneumonia may sometimes be caused by fungi. Which children are at risk for pneumonia? In addition, children younger than one year old are at risk if they are around secondhand tobacco smoke. This is especially true if their mother smokes. Early symptoms of viral pneumonia are the same as those of bacterial pneumonia. But with viral pneumonia, the breathing problems happen slowly. Your child may wheeze and the cough may get worse. Viral pneumonia may make a child more at risk for bacterial pneumonia. The symptoms of pneumonia may look like other health problems. Make sure your child sees his or her health care provider for a diagnosis. How is pneumonia diagnosed in a child? Chest X-ray. This test makes images of internal tissues, bones and organs. Blood tests. A blood count looks for signs of an infection. An arterial blood gas test looks at the amount of carbon dioxide and oxygen in the blood. Sputum culture. This test is done on the mucus (sputum) that is coughed up from the lungs and into the mouth. It can find out if your child has an infection. It’s not routinely done because it is hard to get sputum samples from children. Pulse oximetry. An oximeter is a small machine that measures the amount of oxygen in the blood. To get this measurement, the provider tapes a small sensor onto a finger or toe. When the machine is on, a small red light can be seen in the sensor. The sensor is painless and the red light does not get hot. Chest CT scan. This test takes images of the structures in the chest. It is very rarely done. Bronchoscopy. This procedure is used to look inside the airways of the lungs. It is very rarely done. Pleural fluid culture. This test takes a sample of fluid from the space between the lungs and chest wall (pleural space). Fluid may collect in that area because of the pneumonia. This fluid may be infected with the same bacteria as the lung. Or the fluid may just be caused by the inflammation in the lung. How is pneumonia treated in a child? Treatment may include antibiotics for bacterial pneumonia. No good treatment is available for most viral pneumonias. They often get better on their own. Flu-related pneumonia may be treated with an antiviral medicine. What are possible complications of pneumonia in a child? How can I help prevent pneumonia in my child? Pneumococcal pneumonia can be prevented with a vaccine that protects against 13 types of pneumococcal pneumonia. Doctors recommend that children get a series of shots beginning at age 2 months. Talk with your child’s health care provider about this vaccine. Another vaccine is available for children older than 2 years who are at increased risk for pneumonia. Talk with your child's health care provider to see if it is recommended for your child. Also make sure your child is up-to-date on all vaccines, including the yearly flu shot. Pneumonia can occur after illnesses such as whooping cough and the flu. You can also help your child prevent pneumonia with good hygiene. Teach your child to cover their nose and mouth when coughing or sneezing. Your child should also wash their hands often. These measures can help prevent other infections, too. Your child can be vaccinated against pneumococcal pneumonia. There are two types of vaccines that can help prevent pneumococcal disease. The vaccine that is right for your child depends on their age and risk factors. Talk with your child's health care provider about which vaccine is best for your child and when they should get it. A dedicated team of nearly 100 professionals provides respiratory care services around the clock for outpatients and inpatients at Children's National Health System. Our therapists excel in the field for their technical knowledge as well as their expertise in working with kids. 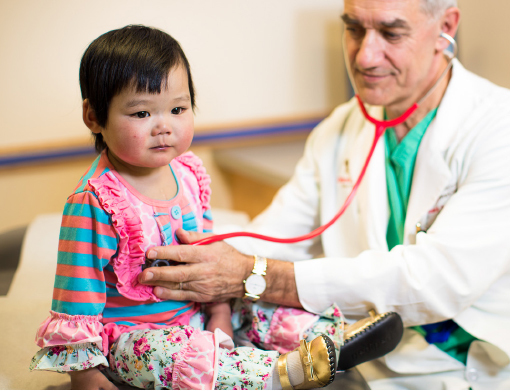 Children’s National is ranked by U.S. News & World Report as one of the nation’s best pediatric hospitals for pulmonary medicine because of our expertise in the field and the quality of care provided to patients and their families. With the only pediatric, cardiac and neuro-intensive care units in the immediate Washington, D.C., area, Children’s National Health System is the region’s leading provider of critical care medicine for seriously ill and injured infants and children. Children's National has one the largest and most active pediatric sickle cell programs in the country. The Pediatric Pulmonary Fellowship is a three-year program that trains individuals to become board-certified pediatric pulmonologists with emphasis on clinical expertise and research experience. The Airway Program is a specialized program in the Division of Otolaryngology (Ear, Nose, and Throat), one the largest and most prestigious pediatric otolaryngology programs in the country.